Draw 1 card. Gain 1credit for each copy of Exclusive Party in your heap. Does the Runner gain 1 for the played copy of Exclusive Party? No. Events are not trashed until they finish resolving. Does "Limit 6 per deck." apply during a draft? Yes. As it is part of the card text, this limit applies even during a draft. So, this card has received a lot of hate in my local meta. Words like 'it is just objectively bad', 'strictly worse than putting in better cards', and 'the math doesn't work out' have been rather liberally bandied about. Which made me think a fair amount about evidence against such statements. I'm happy to see that most of what I wanted to say has already been said. Great job Netrunner community! Nonetheless, I'm going to try and convince you that not only is this card not objectively bad, but it's actually fantastic in the right build. Building economy for your deck is all about how you warp this ratio in your favour. Magnum Opus doubles your click efficiency giving you 2 per while Professional Contacts does so by giving you a card and a for each click. But of course, they don't offer you this efficiency for free. You need to invest and in that case of Magnum Opus, as well. These are great examples because it's fairly obvious how their efficiency works. Okay? Cool. But we're not talking Shaper here, we're talking Criminal And to be clear, this really is a Criminal card. As tiediedvortex points out, you want to run all 6 and I can't imagine any deck sparing 6 influence for it. Also, this is a draw engine with economy attached and not the other way around. So let's compare it to some event based draw in criminal. It's a pretty short list. Fisk Investment Seminar. And done. Oh, did we mention it was priority and gives your opponent that same amount of cards? Economically it nets you only 2 cards (over what you were already getting anyway) and it still sees play. So Exclusive Party is either the best or second best event draw Criminals have. Sure, there's also Drug Dealer but again it comes with the drawback of negative drip economy you can't turn off and it's a resource. So, the math works out when you build a deck where draw is more important than burst economy. The most obvious case is combo decks, like stealth that sees lots of play in criminal or Snitch & Au Revoir. You need to get your pieces out fast. Let's not forget you can go tag-me with this economy without fear. So far we've just talked Criminal card pool. Street Peddler would work well with it or Faust as Yziel mentioned. It could even possibly work with Faust and Drug Dealer combos which giving you burst money when you need it. I think this is a subtle and well-designed card. It's not as obviously 'good' for all decks as something like Sure Gamble but it plays an interesting role for Criminal builds. Sorry I'm so long-winded. As I've said in some of my other reviews, the economic value of a card is the number of credits it gives you for doing things you would have been doing anyway. Sure Gamble gives you 4 for one click, which is 3 more than clicking for credits, so it has a value of 3. If you use Dirty Laundry to make a useful run, then you're getting a net gain of 3 for no extra cost--but if you make a throwaway run on an empty Archives, it's only a value of 2. With me so far? Playing the first Exclusive Party costs you a click, and draws you a card. Assuming you would have clicked to draw that card anyway, that means you're getting your value back, and nothing else (remember: events don't go into your heap until they resolve.) So the first Exclusive Party has an economic value of 0. Gross. But every one after that causes it to creep further and further up the economic tree. The second is as good as an Infiltration for cash. The third is an Easy Mark. The fourth is a Sure Gamble. The fifth is a cheaper Lucky Find. And the sixth is...well, there isn't a comparison, but it's damn good. Since you have to get through the low-value versions first, another way to look at it would be the average value per card. Playing three Parties gives you 1 per play on average, four gives you 1.5, five gives you 2.0, and six gives you 2.5. Looking at typical economy options, most players won't bother playing a card with an economic value below 2. Easy Mark (with a value of 2) does occasionally see play; we'll call that the minimum to be playable. So to really justify including Exclusive Party, you need to be confident that you will see at least 5 of them per game, and 6 fairly frequently. Which basically means you need to be drawing your entire deck. Every game. That's a big ask. 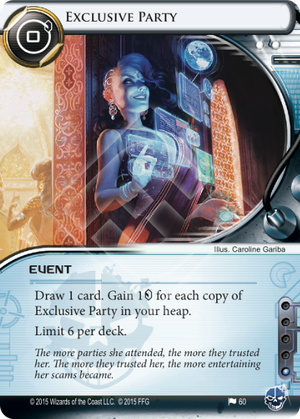 Of course, many decks do draw their entire decks (LARLA sees play for a reason), and you're already going to be drawing through six of them with Exclusive Parties, but they just aren't enough. You are going to need some way to draw cards faster, whether that's Wyldside, Geist, or the brand new Patron. Note, however, the anti-synergy with Professional Contacts and Symmetrical Visage. These cards don't draw you cards any faster, they just give you money when you do draw cards. Since this is the same effect as Exclusive Party, and they don't combine, you're better off picking one or the other. So if you're already playing a draw-heavy deck, Exclusive Party lets you earn money as you slurp up your stack. But this brings us to the next issue: card slots. See, there's enough diversity in the Netrunner card pool that you want to be able to counter whatever gets thrown at you. There are an enormous number of silver bullets, some of which (like Clot or Plascrete Carapace) are the only thing standing between success and failure against certain decks. Including six Exclusive Parties means you have six less slots to spend on these cards. But having less than six means you won't see enough of them to be worth including at all. So I guess the conclusion is this: if you're playing a slow archetype that wants to draw its entire stack every game, and you're okay having fewer deckbuilding options, and you're either in Criminal or have six influence to spare, maybe try Exclusive Party. Worth noting that you don't have to PLAY these to get them into your heap. I don't know if MaxX: Maximum Punk Rock could ever justify the 6 influence or any Criminal could go heavy self-mill, but any copy of this you ditch in some other way ends up in your heap regardless. So, for example, if you mill 5 and play the sixth then you just get the super high value one. Other thing worth noting is that once they ARE all in your heap, any recursion will leave almost all of them in there. You'll need to play targeted stuff like Trope (so no Levy AR Lab Access for you) but the potential to keep cashing in on the high end of the spectrum is there. Whether it's worth shoehorning that potential into what's probably an Anarch deck is another matter entirely, although I'm sure Apex: Invasive Predator wouldn't mind facedowning the early copies of this to use as Endless Hunger fodder. Only problem is, Apex playing this has got to be the worst flavor mismatch I have ever seen. Well, that and the six influence. And the deckslots I guess. But mostly the flavor thing. eParty is, again, overall decent but not great on it's own, but in the right strategy could be worth using. Remember the flavor text on baliff? "effeiciency is making money on what you were doing anyway". Criminal has lots of ways to make money, but not many for drawing cards. Outside of geist and earthrise hotel, crim doesn't really have any "draw engine" cards, and thus will likely get most of their cards by clicking for them. eParty gives you money for doing that, and basically thins your deck out while throwing you some cash. ProCo/Baby have similar effects, but Proco is out of faction and costs a ton to put down, and copies are useless, Baby easy to put in, but is limited to one a turn and doesn't filter your deck, and copies are again dead draws. Drug dealer is a thing but costs you money every turn. Slotting those 6 cards into a deck may be very difficult, but in the right deck, (say an andy or Sillo) it should allow you to play an extrememly fast and hyper-agressive early game deck where you get free extra money while finding your combo pieces and can jumpstart from low credits easily (the 4th eparty is an easy mark plus a card draw). It can also allow you to run a somewhat more reliable combo deck, since you are essentially thinning your deck 6 slots while making money. I may have missed it in the other reviews but one effective way of getting the first few into you heap is to just break ICE with Faust. It allows you the ability to play a card for money without depleting your hand for faust runs since it replaces itself and the first 2-3 you see you can just break with if you don't have time to play them.